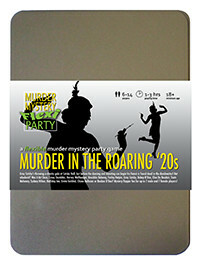 You've been invited to play the role of HALLIDAY INN in Murder in the Roaring '20s. Gray Catsby has invited his most talented and wealthy friends to a charity gala event at his countryside residence, Catsby Hall. But before any dancing and donations begin, Catsby’s fiancée, Ginger Whiskers, is found dead in the dumbwaiter! Join the flappers and dappers to find out who finished her off! You like to be the centre of attention and will wear anything as long as it’s covered in gold or pearls (although you prefer a simple black hairband). The stripes on your dress represent the many floors of your family’s hotel empire. You’ve been raised to always expect the best things in life. Diamonds for Christmas, a pony for your birthday, everything you could ever want provided by your rich, doting daddy - mainly because he feels guilty about the string of new wives and step-children he keeps bringing home. Still, as long as the presents continue, you’re happy to forgive his little mistakes. Well, isn’t this a fun caper?! Who’d have thought a boring old charity gala would turn into a murder investigation? How nifty! Oh, forgive me! I completely forgot to introduce myself. I’m Halliday Inn, darling of the debutantes and - until recently - heiress to the Inn’s Inns fortune. My Daddy used to own a string of fancy hotels which were ab-so-posi-lute-ly the bees knees. I should know - I used to live in one! Now I live with my half-sister, Premya and between you and me, her place is the pits.